An Energy Park is a concept to optimise the generation of energy out of all available sources of waste. We do not focus on mono- energy source parks, like a solar/PV park, but we focus on multi-energy source parks. Airports have a high need for energy and several sources of waste. Airports can move to autarkic airports by developing the concept of an energy park. Next to solar power, biomass, food waste, grass are sources to produce gas or electricity. Digestate and CO2 are perfect sourced to grow vegetables and contribute to food security on and around the airport. Vidras Technology has developed a concept to be less depended on energy purchase. 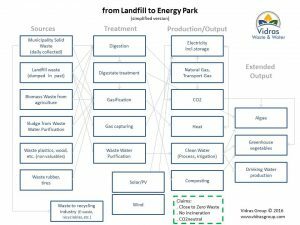 Landfills have a lot of different (daily new) waste and mostly a huge storage of dumped old waste. Many countries/cities have big issues how to deal with the waste issue in the future. New landfills are most of the time not THE solution. The economic and population growth of the cities increase the problem year over year. 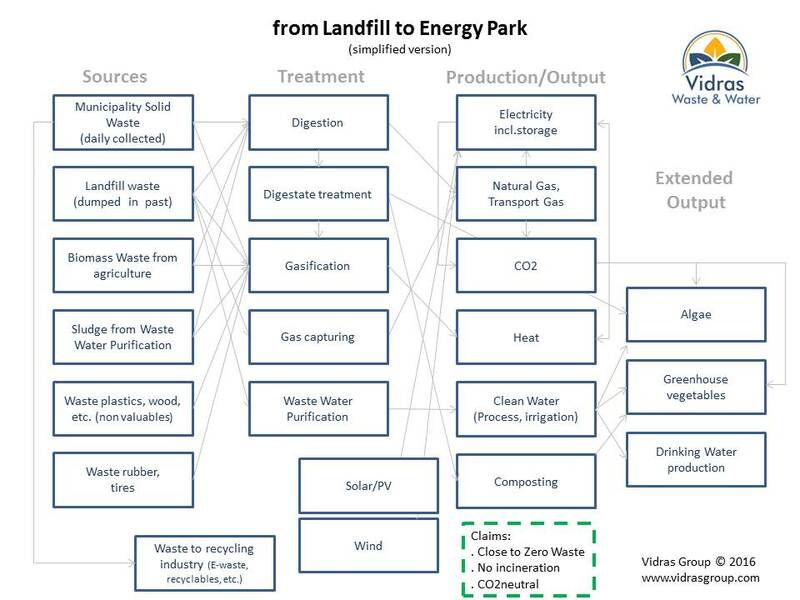 Vidras Technology has developed a concept how to move from a landfill to an energy park.